The Oud, is an exotic, enticing blend of velvety, floral Oud with evocative, spicy mid-notes, which envelop a sensual arbour of musk. Slip into a warming, voluptuous effusion of rich floral Oud and sensual white musk, and allow your senses to be transported to alluringly exotic, balmy, far-off paradises. The scent of The Oud unfolds, like a desert rose, upon the skin, and is sure to make a lasting impression. 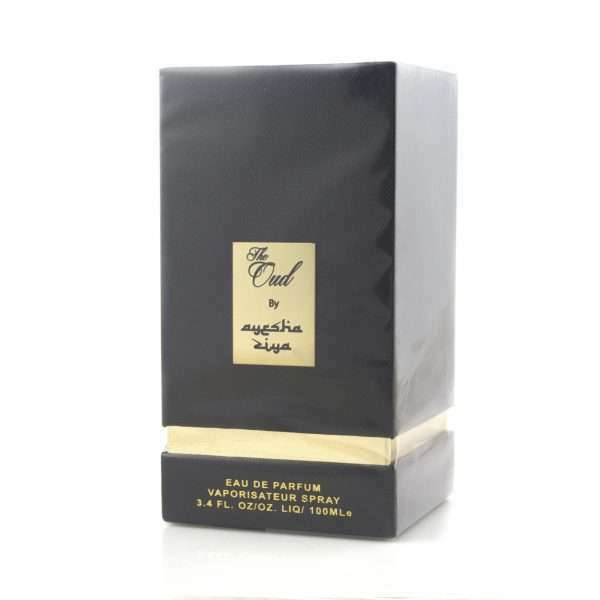 Oud, otherwise known as Agarwood is Renowned for being one of the most expensive woods in the world. The Ayesha Ziya collection has embodied the rich and sensual scent into their range. Oud, is a well-known aphrodisiac, both in oil form and as incense, it is often described as “a sweet, deep but balanced fragrance”. Most often a base note in fragrances, Oud is non-irritating and in its oil form it can be applied directly to the skin. The Ayesha Ziya Fragrance range took Instagram by storm and more recently has become very popular in store too. The most popular fragrances from the rage are ‘IRUM’ and ‘THE OUD’, often purchased as ‘HIS & HERS’ gifts on weddings and special occasions. Although often bought as a ‘his n hers’ package, ‘THE OUD’ is very much a unisex scent and can be enjoyed by women and men alike. I would describe the fragrance as woody, spicy, and floral.